The information flow surrounding the 230 Broadway project has been fairly typical if not a little more mysterious than other large scale developments on Capitol Hill. Big money efforts that impact existing tenants rarely telegraph their moves to the friendly neighborhood blogger man. Instead, in addition to the design review meetings, etc., clues can be found here and there that provide an impression of the business going on behind the scenes to get a building with 235 residential units and 23,000 square feet of ground floor commercial space constructed and developed on Broadway. Here’s a clue we found in a bagel. 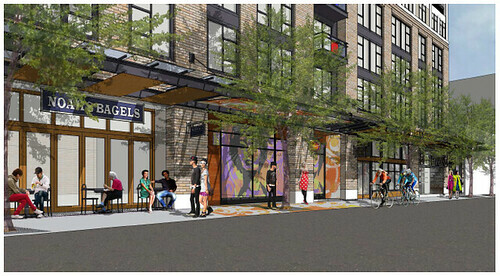 While other restaurants like Cafe Septieme have stepped aside as the project pushes toward a start of construction, we have learned why Noah’s Bagels appears in SRM Development’s artist renditions of the future mixed-use building while Pho 900 does not. The discussion with Scholten also yielded some more clarity on the 230 Broadway project’s timeline, something SRM has been reluctant to discuss with CHS in the past. According to Scholten, she is planning for the Broadway store to remain open until just before demolition preparation begins. She says the company has been told that will likely come sometime in January. We’ll check in again with SRM to see if they can confirm the schedule. After that, there won’t be a Noah’s on Capitol Hill for a year or two. 15th Ave’s Bagel Deli is one option. Eltana’s Montreal bagels will be another after they open in the Packard Building this fall. Scholten, meanwhile, would like to encourage you to visit the three other Seattle locations in her national bagel chain. The closest is down in Pioneer Square on 4th Ave. They must really like being with SRM. I was thinking the Joule would be a good location for them. Uniqueness? Please. Cap Hill was ruined years ago by the alterna-douchebag-hipsters who added nothing but hilarious pseudo-angst and carbon-copies of their supposed “unique” looks. Just because alternative people don’t look like they shop at J Crew doesn’t mean that they all don’t look exactly like one other (and they are everywhere). Explain to me how that’s unique? The first step in gentrification will be unsavory with all the chains moving in. Ideally, as Broadway becomes a huge destination for people that actually live there (new condos/apts), let’s hope more local restaurants/bars/shops move in.